Our patron, righteous father Alexis of Wilkes-Barre, was a missionary priest, sent from his homeland in Slovakia as a Uniate, who, in order to serve and protect his flock in the United States in a hostile Latin environment, recognized the need to lead them in a return to their Orthodox Christian heritage. His feast day is celebrated on May 7. Alexis Georgievich Toth was born to Father George and Cecilia Toth on March 14, 1853, near Eperjes (now Presov) in Zepes county of Slovakia during the reign of Franz Joseph Emperor of Austria and King of Hungary. He followed in the steps of his father who was dean of the United Greek Church in the county. He was educated in the local preparatory schools and then went on to the Roman Catholic seminary for a year and then on for three years to the Uniate Greek Seminary in Ungvar. He continued on to the University of Prague where he graduated with a degree in Theology. After marrying Rosalie Mihaluk on April 18, 1878, he was ordained to the priesthood in 1878 by Bishop Nicholas Toth, the Uniate Greek Catholic bishop of Presov. In a few years his wife Rosalie, whose father also was a priest, and their only child were to die. After his ordination Father Alexis was an assistant priest in Saros county before becoming the curate in the United Greek Catholic Church in Homrogd. Then Bishop Nicholas Toth appointed Father Alexis his chancellor. In 1881 the bishop appointed him director of the United Greek Catholic Seminary of Presov and professor of Canon Law and Church History. He continued in these position under Bishop Toth's successor, Bishop John Valyi. Then late in the 1880s, Father Alexander Dzubay, who studied with Father Alexis in the seminary, wrote a petition from America to Bishop John asking that Father Alexis be sent to America. The bishop agreed and sent Father Alexis as a "missioner."' He arrived in the United States on November 15, 1889, and on Thanksgiving Day, November 27, Father Alexis conducted his first services in the new St. Mary's Church in Minneapolis as the first resident priest to serve this church officially. However, the church edifice was incomplete, there were no furnishings, no vestments, but a debt. Over the next year Father Alexis worked with his community, preaching, asking for donations, acquiring furnishings, vestments, and bringing the parish to an organized, stable institution, all this without receiving any salary. As a Uniate, Father Alexis understood that he must visit the ruling Roman Catholic bishop in the area, Archbishop John Ireland in Minneapolis. Archbishop Ireland was a strong advocate of the "Americanization" movement within the Roman Catholic Church, and thus was a strong proponent of the Americanization of the Catholic immigrants. And in this regard, Archbishop Ireland looked upon Father Alexis and his flock as an alien sect that did not have the capacity or desire to fit into his plans for Americanization. 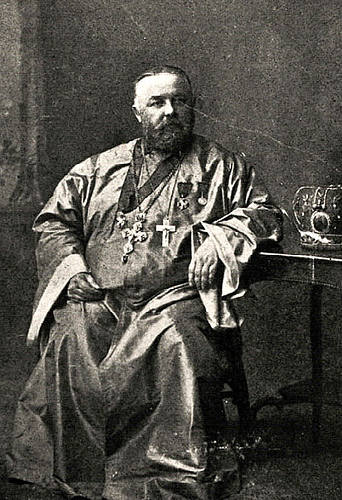 So, upon presenting his credentials to Archbishop Ireland on December 19, 1889, the Archbishop immediately rejected him as a Catholic, not recognizing the Greek Rite nor Father Alexis as a priest nor even his bishop. Archbishop Ireland directed all Roman Catholic priests and their flock to not have any relations with Father Alexis and his people. Father Alexis sent reports to his bishop in Slovakia about his reception by Archbishop Ireland but heard nothing in return. Other Uniate priests in the United States sent letters to Father Alexis reporting that they had had similar confrontations. The problems for the Uniate priests reached a head after they met to discuss their situation. They learned that they were to be all recalled and returned to Europe. These confrontations brought Father Alexis to a course of action about which he had thought about before and that was to return to Orthodox Christianity. On December 8, 1890, St. Mary's parishioners wrote to the Russian Consul in San Francisco to obtain information about a Russian Orthodox bishop and followed up by traveling to San Francisco to talk with Bishop Vladimir (Sokolovsky) of San Francisco. Then, in February 1891 Father Alexis traveled with a parish group, led by the Church Warden, Paul Podnay, to met with Bishop Vladimir. At this time Father Alexis was received into the Orthodox Church. Bishop Vladimir, hearing that Father Alexis was not receiving any pay, established a stipend to help him. On March 25, 1892, Bishop Vladimir visited the St. Mary's parish and formally accepted the community of 361 immigrants into the Russian Orthodox Diocese of Alaska and the Aleutian Islands. On July 14, 1892, the Ruling All-Russian Holy Synod officially approved and sanctioned this move. By this action Father Alexis Toth gained the distinction of being the first Uniate Greek Rite Catholic priest in America to lead his people in reunion with the Orthodox Church. Having been sent originally to America to be a missionary to the immigrants, Father Alexis, in his new role, was to fulfill his destiny as the missionary leading his people back to the Orthodox Church. In December 1892 he evangelized the immigrants in WilkesBarre, Pennsylvania, preaching and enlightening them about their social and religious future in America. In 1902, he received the parish of St. John the Baptist in Mayfield, Pennsylvania, into the Orthodox fold. Elevated to the rank of protopresbyter, he was in the forefront, over the years until his death, of receiving parishes from the Unia into Orthodoxy. Through his efforts over 20,000 Carpatho-Russian and Galician uniates were re-united with the Orthodox Church. On May 7, 1909, he died and was buried in a special shrine at the St. Tikhon's Orthodox Monastery (South Canaan, Pennsylvania). On May 29, 1994, Protopresbyter Alexis Toth was glorified as St. Alexis of Wilkes-Barre. Source: Tarasar, Constance J. Orthodox America 7794-7976 Development of the Orthodox Church in America. Syosett, New York: The Orthodox Church in America, 1975.